One of the great things about the level of interaction that Randy Bowen of Bowen Designs has with collectors is that we often see statues right from the development phase and can really enjoy anticipating their release. 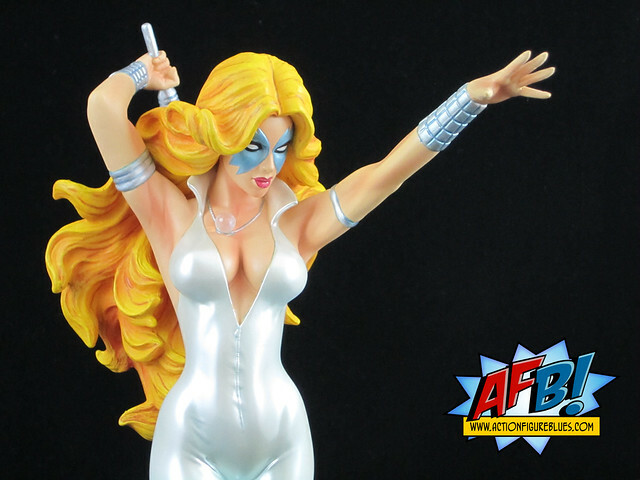 My review tonight looks at a statue that has been a long time coming - from years of fan demand to finally appearing on our shelves - the Bowen Designs Dazzler Statue. This is sculpted by Mike Cusanelli, who has been doing a great deal of work on the ladies of Bowen lately. While there are often some composition issues with Cusanelli’s work (lack of energy in poses is usually my big complaint), he does have a great command of the female form, and I love the way that Dazzler has been sculpted as a healthy, shapely woman and not just a stick figure. This statue has an issue that is not terribly uncommon with pieces like this - when viewed at eye level, it’s a little bit hard to see Dazzler’s face as her head is angled facing down. To get a full appreciation of the character’s visage, you either need to place her on a high shelf or lie on the floor and look up at her. These angle issue always strike me as odd, as you would expect these things would be ironed out in production, and the fact that the angle presents as different from both the promo and the packaging shots (again, a common occurrence) seems to me to indicate that producers see the issue as well. I’m not sure what the answer is here but it’s something I often scratch my head about when opening and inspecting new statues. As for Cusanelli’s composition issues, they appear here not just in the angle, but in the pose, which makes absolutely no sense. 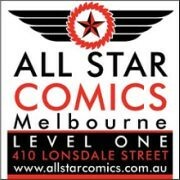 Dazzler is holding her microphone in her right hand behind her head like a hairbrush or a back-scratcher while her left hand is outstretched. There might be a degree of logic to this if she was emanating some sort of light construct from her outstretched hand, but without it the pose is, at best, bemusing. At one stage it was suggested that a cord might be included with the microphone which would swirl around Dazzler. While it was a clever idea, I’m glad they decided against it as there is enough happening here and I think ultimately it would have detracted from the overall look and effect of the piece. Pose aside, the sculpting is solid. Very nice lines and natural folds and creases in her clothing, and her jewellery accents are very nicely done with some clever detail. Her voluminous hair is beautifully sculpted. I am always impressed with sculptors who can really give the impression that a subject is wearing clothes instead of them just looking painted on, and Cusanelli has definitely accomplished this with Dazzler’s outfit, with lovely touches like her collar and flares very nicely done. The paint job does a great job of adding dimension and depth to the piece with a nice mix of matte and sheen finishes. 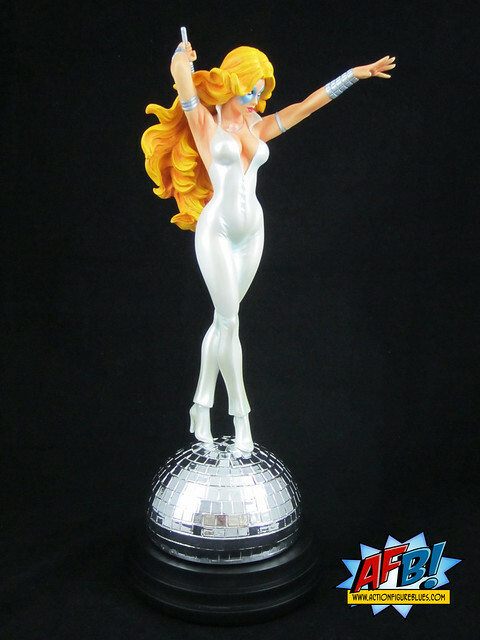 There is a lovely shine to Dazzler’s white costume which really adds a lot to the overall effect. The only issue I have with paint is on the hair, where it’s perhaps a little bit thick and blocky, causing some of the sculpting definition to be lost. One thing that surprised me about this piece was the construction of the base. The statue slots into a half mirror ball base, and also comes with a black disc for the mirror ball to rest on, but the two are separate pieces with no connectors, so the two together are a bit slippery to carry or move - be careful. Bowen has done this type of base construction before (see Brown Costume Wolverine) but not for some time. 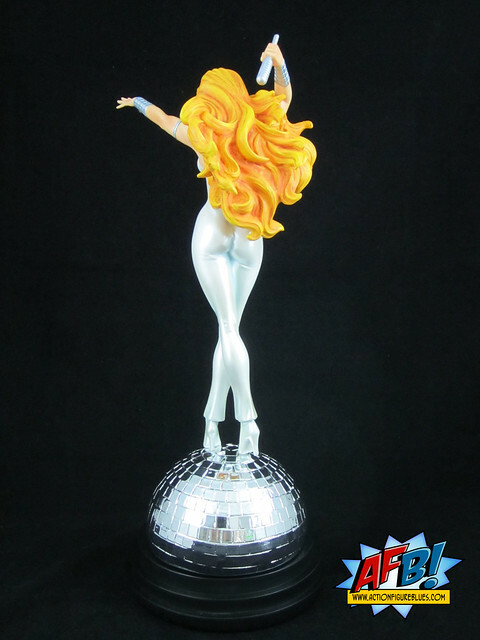 While there are some issues that keep this statue from being perfect, I don’t think any of the things I’m bothered by would dull the enjoyment that diehard Dazzler fans are going to get from this long-awaited statue. It does make a very impressive sight on the shelves and fills a big gap in the 1970s-era Bowen Display. As a big fan of Dazzler’s original X-Men tenure, I am really hoping that we will see a blue costume version coming soon to make a great set of Bowen Dazzler bookends! Oh man does that ever look fantastic! And the Disco Ball base is such a nice touch. I wish they would bring back this costume back for this character.